This is Kurtis from Covering the Mouse sharing a little bit of my Disney collection with all of you folk lovers! Boyhowdy has been a guest poster on my site a few times and now he has asked me to be one for his site! And I am more than happy to help him out! And if you’re looking for Boyhowdy, then you’d better head on over to Fong Songs where he is today’s guest poster! Winnie the Pooh is a book series by A.A. Milne from the 20s. The bear in the book is based on a stuffed bear owned by his son, Christopher Robin Milne. The stuffed bear is based on Winnipeg, a bear from the London Zoo originally from Winnipeg, Manitoba. Christopher named his bear Winnie and asked his dad to write some stories about him. In the sixties, the Walt Disney company adapted the stories into a trio of animated shorts. It is here that we are introduced to the characters as we now know them as well as the classic theme song. 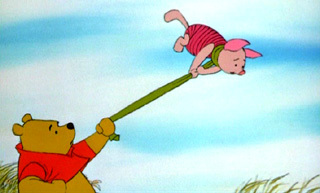 The theme song was written by Robert B. and Richard M. Sherman for the 1966 short Winnie the Pooh and the Honey Tree. It is one of the most recognized of all Disney songs and is heard in almost every Pooh production ever made by Disney. But enough about history, let’s get to the covers! While Simon’s main body of work filled the rock world in the 70s and 80s, she has really mellowed out having released albums of standard, lullabies and two soundtracks for Winnie the Pooh movies. This cover was written for the 2003 feature film Piglet’s Big Movie and was heard again in Pooh’s Heffalump Movie in 2005. She adds a really nice folk touch to the song and the only part that I really don’t like is when it breaks into the string bridge. Otherwise, it’s a great cover! The track can be found on both soundtrack albums. Boyhowdy wrote up a review of this cover on my site and reviewed it better than I could so I encourage you to visit that post by clicking here. It is said that Tommy Emmanuel is the best guitar player in Australia. He started playing when he was four and never stopped learning and practicing. He has had several albums since the seventies and if you listen to them you will hear that they he is an excellent guitarist. In the cover, off the sadly out-of-print Disney Duets: A Family Celebration, he plays a medley of two songs: The classic Winnie the Pooh theme as well as his version of the theme song from The New Adventures of Winnie the Pooh television series from 1988. Interspersed throughout the track are readings from the book by Tommy’s daughter Amanda. The father/daughter team up is very touching and really captures the essence of the silly old bear. I’ve included two Jungle Book tunes for you to hear. Please check out my site for more information about these artists.